Brand Name:Travel Inspira Rated Current:6A MAX Rated Voltage:100-240VAC Application:Residential / General-Purpose Grounding:Non-Grounding Model Number:VG5506 Type:Electrical Plug This charger adapter plug converts the power outlet only, it does NOT convert electrical output current and voltage!!!! Accepts plugs from more 150 countries with US/EU/UK/AU plugs. 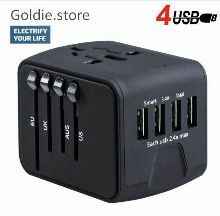 All-in-one adaptor with built in surge protector. Dual USB ports. Ideal for iPad, iPhone, and all cell phone Chargers. 5 different input plugs tightly connect into 1 adaptor, equipped with Built-in safety shutters. Which country you can use it? The adaptor accepts plugs from all countries including China, Japan, USA, Europe, UK, Hong Kong, Singapore, France, German and more 150 countries. But can not be used in South African, India, Swiss and Italy. Please pay attention to avoid any inconvenience. What devices can be charged? You can charge your cell phone, camera, iPod, Ipad and other electronic products via specified plugs or USB port. However, this 5 function combined into 1 designed also save your space and time during the travelling. Is it safe? Built-in safety shutters protect users from the direct touch of the live parts on the socket outlet, especially for the children. Please follow the user instruction and prevent yourself from harm and damages . ***Adapter plugs do not convert Voltage, ensure that your mobile electronics take input voltage from 110-240. No conversion is required when you mobile electronics power plug is the same as the wall. Pls. understand we dont deliver this product to Serbia and Bosnia and Herzegovina and Kosovo. We are not responsible for any custom duty or import tax.